"The Vorticist is at his maximum point of energy when stillest." Vorticism blasted onto the London art scene, becoming England's first radical avant-garde group. Embracing contradiction, humor, and ostentatious rhetoric, the Vorticists celebrated the energy and dynamism of the modern machine age and declared an assault on staid British traditions in order to inaugurate a new era where art belonged to all. Rebelling against the genteel semi-abstractions then fashionable among the London bourgeoisie and championed by critics Roger Fry and Clive Bell, the Vorticists developed an abstract style with bold colors, harsh lines, and sharp angles to depict the movement of industrial life. 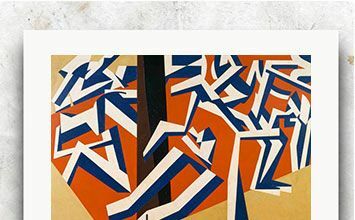 Vorticism encompassed many media, including painting, sculpture, literature, typography, and design in an effort to transform how people interacted with the world. The horrors of World War I, however, dampened their idealization of the machine and dissipated the momentous energy of the group. When poet Ezra Pound named the group, he employed the image of the vortex to describe the creative energy brewing around this group of artists. The artists then elaborated on this metaphor of the vortex to animate much of their aesthetic theory. As Wyndham Lewis explained, "You think at once of a whirlpool. At the heart of the whirlpool is a great silent place where all the energy is concentrated; and there at the point of concentration is the Vorticist." The vortex was also the site of artistic creation. Vorticist compositions rely heavily on diagonals that seem to splinter apart and yet remain solidly contained on the picture plane. Embracing the possibilities of the machine's energy, Vorticism drew on the fragmentation of Cubist composition and the movement championed by the Italian Futurists to develop a style of pared down geometry that evoked both dynamism and a still center. The Vorticists embraced the machine with all of its productive and destructive possibilities. They abstracted machine-age imagery in their compositions and used clean lines and bright colors to further suggest the hard edges and shiny surfaces of the machine. The horror and destruction of World War I caused many of the Vorticists to reformulate the understanding of the place of the machine in modern life, thus largely ending the movement. Formed and named in 1914, the Vorticist group desired to unsettle England's Victorian attitudes toward art. Painter and author Wyndham Lewis founded the movement of artists and writers in an attempt to represent the energy and vitality of the modern era with what he described as "a new living abstraction." While Vorticism has been called the British version of the Italian Futurist movement, which shared similar influences, Lewis and poet Ezra Pound, who coined the name Vorticism, rejected this correlation. "In a poem of this sort one is trying to record the precise instant when a thing outward and objective transforms itself, or darts into a thing inward and subjective. [...]I realized quite vividly that if I were a painter, or if I had, often, that kind of emotion, or even if I had the energy to get paints and brushes and keep at it, I might [have] found a new school of painting, of "non-representative" painting, a painting that would speak only by arrangements in color." This "new school of painting" is a reference to the Vorticist movement, which tended to abstraction and emphasized the use of form and color. Pound's short poem similarly emphasizes the careful arrangement of words to create a pared-back but highly vivid effect. It gives an impression of a moment of stillness in a whirl of motion in the busy Metro, recalling the Vorticist search for the static center of the moving vortex of life. Epstein's Torso in Metal from 'The Rock Drill' was born of the destruction wreaked by the First World War. In 1913, Epstein created a plaster cast of an abstracted human body - angular and hard - with an embryonic form in its abdomen and placed it astride an industrial mining drill. The result was a towering, menacing figure with great phallic power. It presented an image of the future of humanity as cyborgs, a celebration of the merging of man and machine, a vision of the frightening yet exciting possibilities made possible by the machine age. As the devastating results of machine warfare in WWI became clear, however, Epstein's outlook on the future of humans and machines changed (in a way that was typical of many members of the Vorticist movement). As Epstein himself later put it in his autobiography: "I made and mounted a machine-like robot, visored, menacing, and carrying within itself its progeny, protectively ensconced. Here is the armed, sinister figure of today and tomorrow. No humanity, only the terrible Frankenstein's monster we have made ourselves into...."
In response to his experience in the war, Epstein removed the figure from the drill and pared it in half, removing most of its limbs. He then cast it in bronze, and presented it on a plinth. Curator Chris Stephens suggests that Epstein "took an expression of masculine aggression and then emasculated it." Although war and the advent of the machine age promoted an aggressive masculine agenda, the result was mutilation and emasculation (through the loss and injury of a generation of young men). Epstein transformed the sculptural figure from an active perpetrator of penetrative violence to a victim of the violence it previously promoted. Red Stone Dancer, one of Gaudier-Brzeska's most important works, encapsulates his ideas of pure form and Vorticist dynamism. Gaudier-Brzeska abstracts the body of a dancer into broad planes and organizes them in such a way that they seem to twist around each other. The figure appears to be in mid-movement, suggesting continual motion despite the solid feel of the stone. In a 1912 letter, the artist explained, "Movement is the translation of life, and if art depicts life, movement should come into art, since we are only aware of life because it moves." The sculpture shows evidence of the artist's interest in the sculpture of African and South American cultures that he saw in the British Museum as well as his interest in Constantine Brancusi's abstract sculptures. Inspired by these examples, Gaudier-Brzeska developed a technique of direct carving that he felt was expressive of the contemporary age. Ezra Pound, with whom Gaudier-Brzeska worked on a theory of Vorticist sculpture, claimed that the Red Stone Dancer was "almost a thesis of his ideas upon the use of pure form." In July 1913, Pound and Gaudier-Brzeska joined a circle of anarcho-individualists, and as art historian Mark Antliff notes brings a radical political orientation to Vorticism. Anliff argues that "central to Gaudier and Pound's vision of Vorticist sculpture was the metaphoric association of direct carving with the anarchist politics of direct action." David Bomberg avoided labels and did not sign the manifesto printed in the first issue of BLAST, but he had close ties to the Vorticist group and was invited to exhibit with them in their 1915 exhibition. His most accomplished works are the most Vorticist ones he produced, including his masterpiece The Mud Bath. Bomberg lived in East London and frequented the public steam baths used by the local Jewish residents. The baths provided a space both for physical as well as spiritual cleansing. Bomberg reduced the human figures he saw in the baths to flat planes and angles, presenting a mass of them against a red field. While the figures appear geometric, even mechanical, they can also be seen to represent the essential core of humanity. The work takes on a graver significance in the wake of the First World War. The reference to "mud" seems to predict the battlefields of World War I, and the viewer is tempted to draw out a play on words between "mud bath" and "blood bath." The composition is highly geometric and color plays an important role. White and blue shapes are placed against a red ground and offset by a vertical brown column. Human figures are only barely recognizable; it is their movement and interaction that is emphasized, following the Vorticist's desire to present an essential form of humanity through its association with the mechanistic and futuristic. As the founder of Vorticism, Wyndham Lewis was fundamental to the development of the ideas that characterized the movement; however, he produced less visual artwork than might be expected, dedicating much of his early career to writing and engaging with other members of the literary and artistic scene in pre-WWI London. The Workshop demonstrates the clarity of Lewis' vision of Vorticism. Bold lines and bright colors create a jostled composition of planes. The title suggests that the painting represents a physical space, but whether it is an interior or exterior space is difficult to discern. It could be a cityscape, perhaps industrial London, or the interior of a studio, with the sky seen through a skylight. The sharp angles and clashing colors are an assault on traditional composition. As Lewis declared in the first issue of BLAST, "even if painting remains intact, it will contain all the elements of discord and ugliness consequent on the attack on traditional harmony." Helen Saunders was a key founding member of the Vorticists; she signed their original manifesto in the first issue of BLAST and a significant number of her artworks and writings were featured in the publication. She is often forgotten, partly because of Wyndham Lewis' male-centric (and ego-centric) view of the movement. She in fact had made a name for herself before she became part of the Vorticist movement, exhibiting in London and Paris from 1912 onwards, and was mentioned in important reviews by critics such as Clive Bell and Roger Fry. Sadly, no oil paintings by Saunders survive; according to one source, Saunders' sister used one of the artist's oil paintings to cover her pantry floor until the work disintegrated. Of her watercolor works, curator Chris Stephens has said, "Like Lewis' paintings, they have a very strong diagonal dimension, but they also have this sense of uncoiling movement - like a flower opening - which gives them a powerful dynamism. You can usually discern figurative roots to them. When you look closely you can see the suggestion of arms, legs, heads, and figures." Many critics have dismissed Saunders' work as copying Lewis'. There is a clear similarity, and Saunders collaborated with Lewis and also acted as his secretary when he was away at the front, perhaps saving his life by arranging a hospital bed for him when he returned wounded. However, a piece such as Dance suggests that Saunders' work is significant in its own right, showing a deftness of line and an innovative approach to the idea of the "vortex" through, what Chris Stephens describes, as an "uncoiling movement" present in her imagery. Like Helen Saunders, Jessica Dismorr, although little-known now, was well regarded before becoming associated with the Vorticist movement, exhibiting in London and Paris with the Scottish Fauves. Abstract Composition is one of two surviving Vorticist paintings by Dismorr. It has been suggested that some of her other Vorticist works were destroyed after her suicide in 1939, as they were thought to show elements of insanity (she suffered a nervous breakdown after the First World War). In this work, a number of geometric shapes in pastel colors are set against a black background. The shapes suggest architectural forms that overlap and appear to float past each other. In her contribution to the second issue of BLAST, Dismorr described London's architecture as "towers of scaffolding draw their criss-cross pattern of bars upon the sky, a monstrous tartan." While rumored to have had an affair with Wyndham Lewis, Dismorr had relationships with both men and women. The historian Miranda Hickman suggests that Vorticism's appeal for Dismorr lay in the fact that it offered "the free navigation of such city spaces, at this time marked masculine [...] through the gestures, perspectives and qualities associated with its masculinity." Hickman goes on to argue that, for Dismorr, Vorticism offered an antidote to the "effects of 'prettiness' that suggested feminine weakness and inferior artistry."